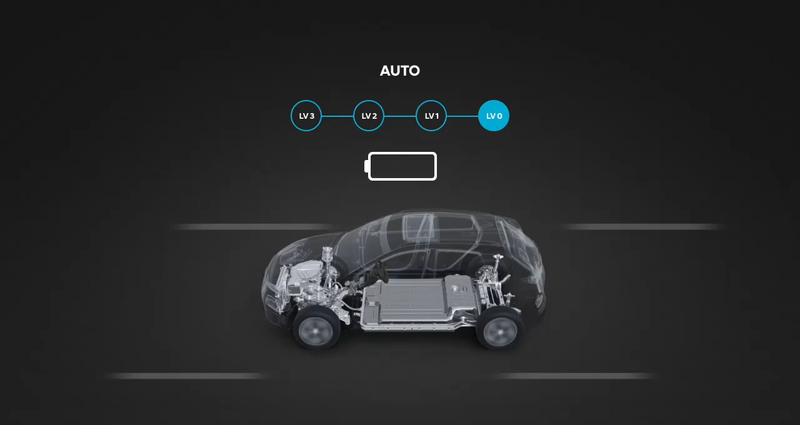 *Relates to 64 kWh battery, dependent on driving conditions. ^price includes current government grant. Go in style. Go electric. 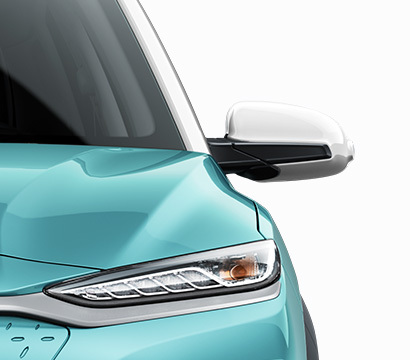 and unique details that highlight the strong Hyundai SUV DNA at its core. Composite light The twin headlight design features powerful halogen headlights on SE and Premium models, with full LED headlights on Premium SE. 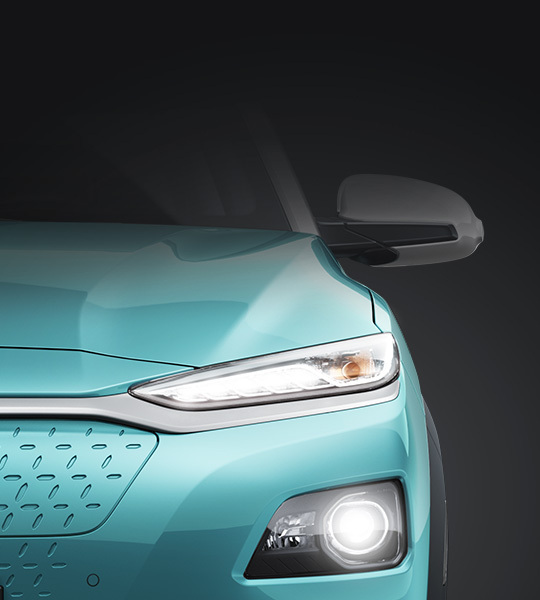 Standard LED Daytime Running Lights combine to create an unmistakable front light signature. 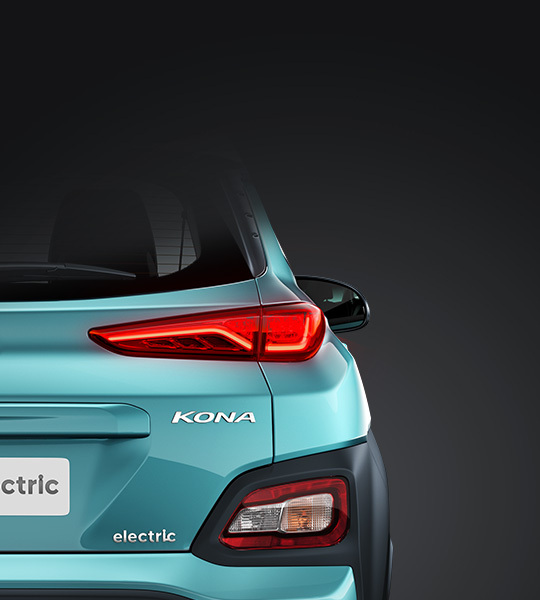 Aerodynamic design KONA Electric has been designed to look good and run better. 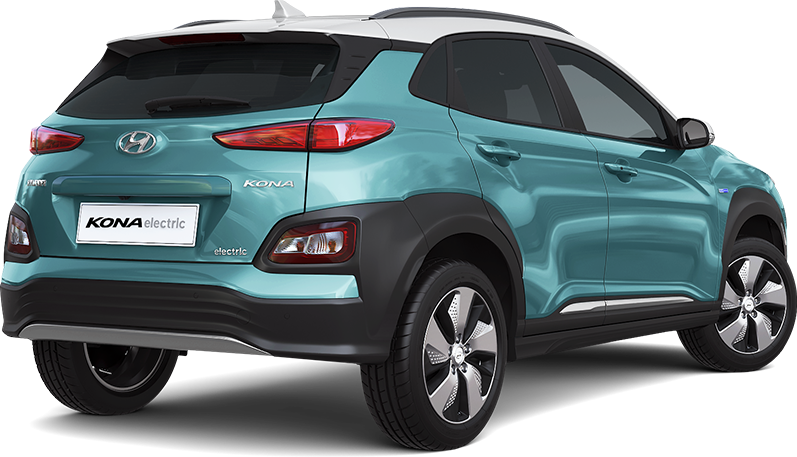 Featuring a closed grille, aerodynamically optimised wheels and underbody, as well as an active air flap in the front bumper. Its overall drag coefficient has been optimised for better efficiency. 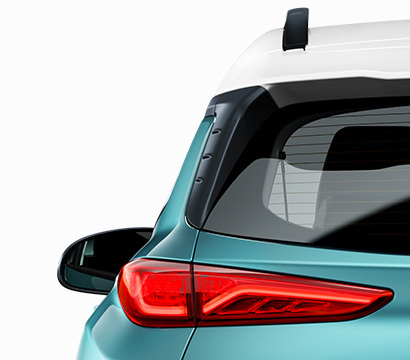 Beautiful and practical With its stable and wide stance, the KONA Electric features a roof rail that visually enhances the sleek roofline and supports up to 80 kg of load – so you can mount a roof carrier. 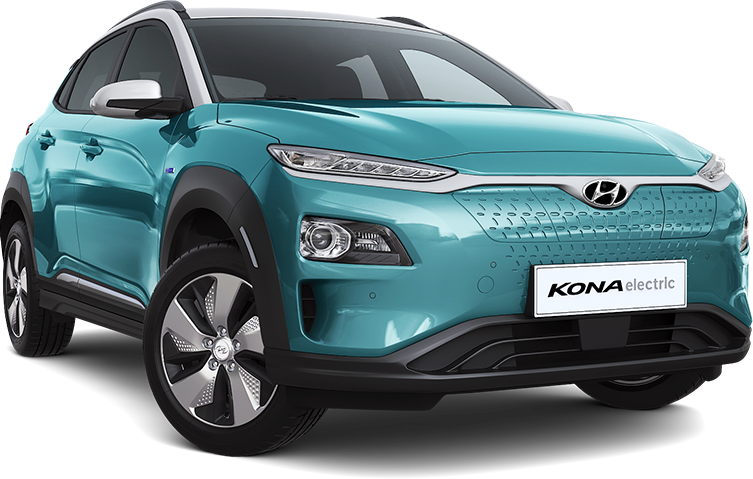 Alloy wheels KONA Electric features exclusive 17” alloy wheel designs, artfully crafted to combine style and aerodynamic efficiency. Wrap-around lights The sleek aerodynamic design theme can also be found in the rear bumper and rear lights. Wrap-around claddings with integrated indicator and reversing lights further emphasise the progressive design. LED rear lights are available on Premium and above. 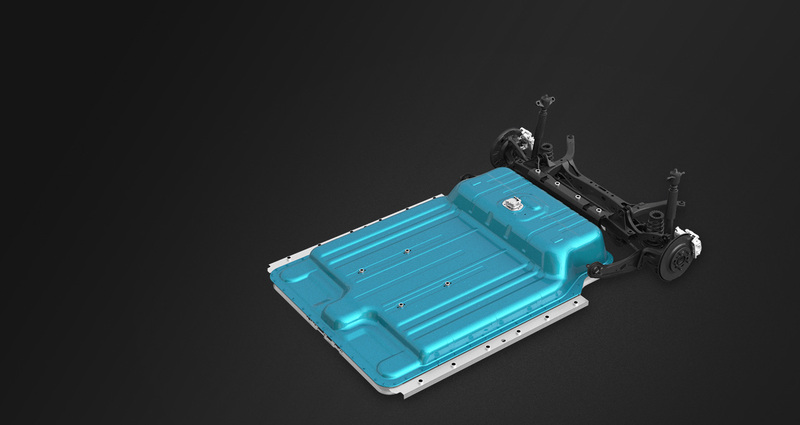 Luggage spaceAn electric vehicle that doesn’t compromise on space. KONA Electric delivers a generous luggage volume of 332 litres, while the wide-opening rear hatch and low load height makes packing hassle-free. 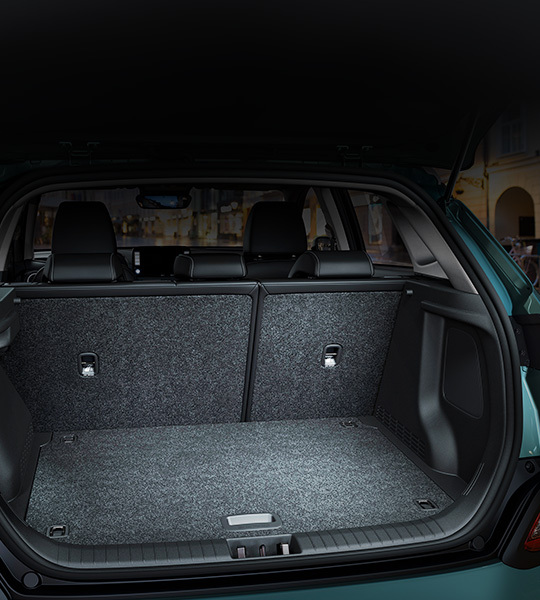 It’s also simple to reconfigure the boot space – at the press of a button you can fold the rear seats flat, making space for 1,114 litres of cargo. 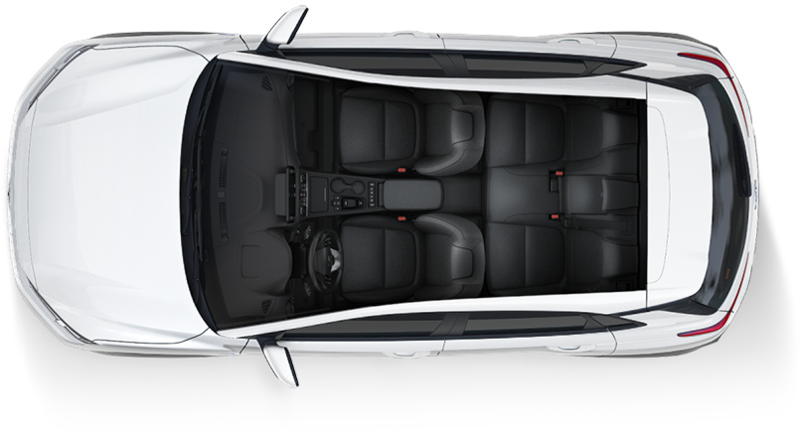 KONA Electric’s distinctive design language continues throughout the spacious cabin. Complemented by a choice of high quality materials and advanced technology, the premium interior delivers an exceptionally comfortable and refined ride for everyone on board. 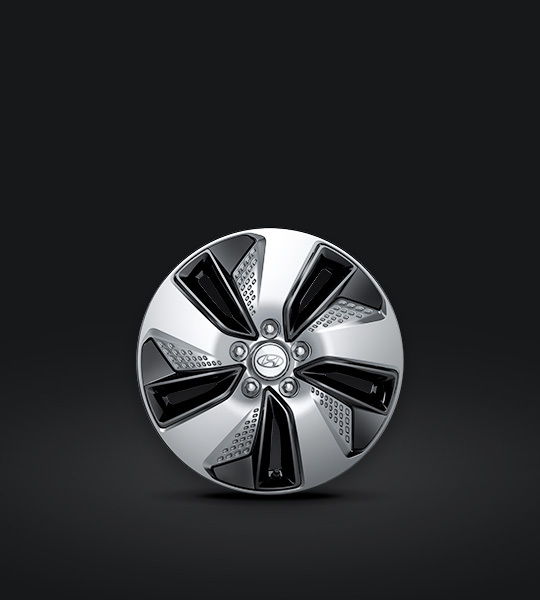 SE and Premium models, with leather seat facings on Premium SE models. The three-tone blue and grey leather interior is available as an option on Premium SE models with Ceramic Blue, Chalk White and Galactic Grey exterior colours. 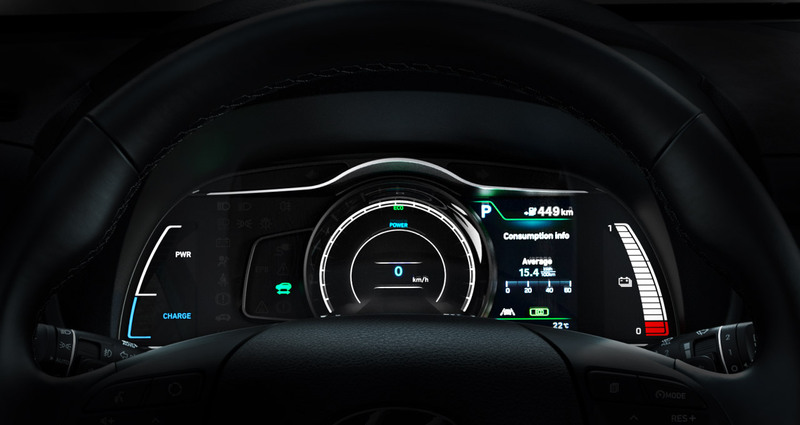 The sporty steering wheel includes ergonomically positioned controls, so you can stay connected and operate car systems while driving safely. 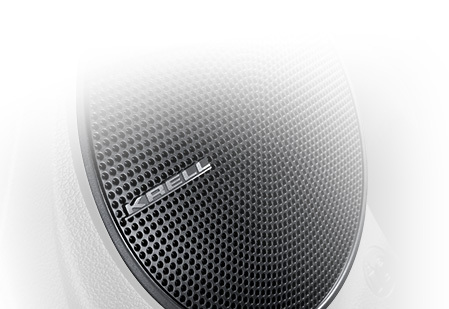 Premium SE models also offer a heated version for even more comfort. Everything you need, right at your fingertips. 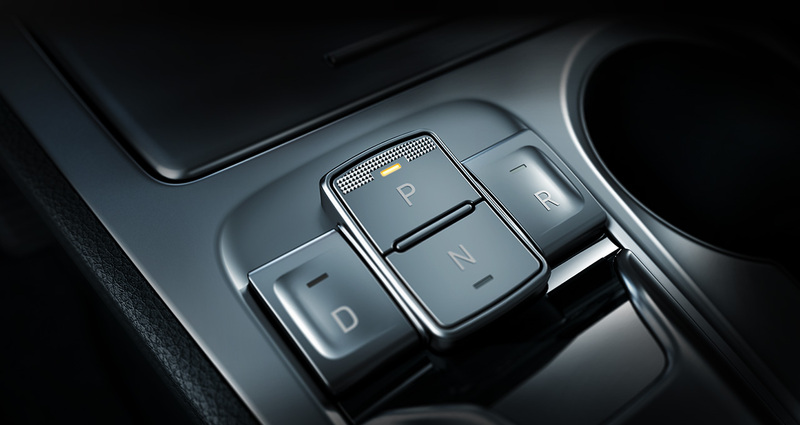 Shift seamlessly between drive, neutral, reverse, or activate the parking brake using buttons conveniently located within the centre console. 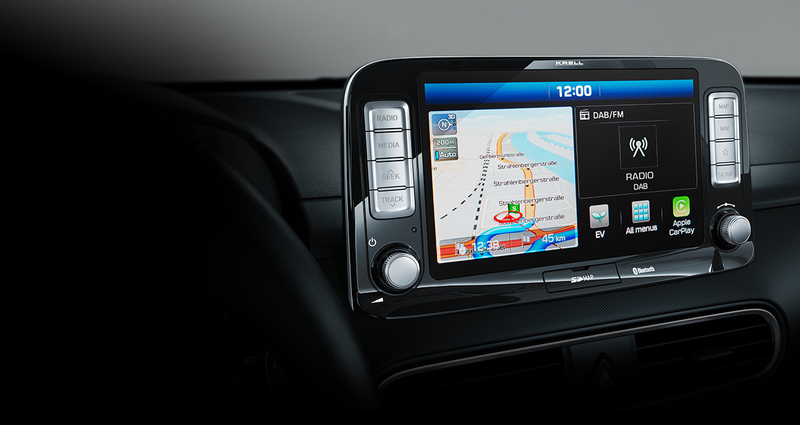 navigation commands, and warnings right into your line of sight. 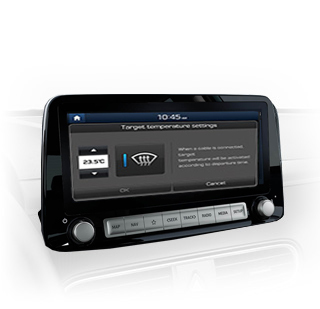 The 8” touch screen on Premium and above integrates 3D navigation, media and connectivity features. It comes with a free 7-year subscription to LIVE Services, with real-time traffic, weather, and POI information. 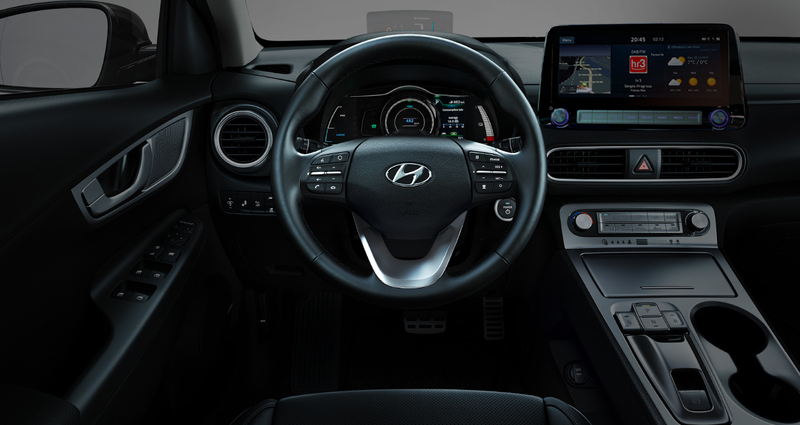 It also features Apple CarPlay™ and Android Auto™ so you can connect your smartphone and have your music, phone and app functions up on the main screen. 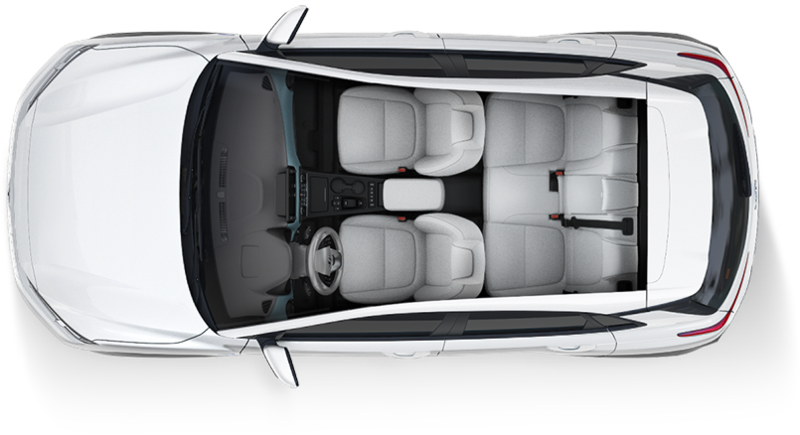 With a spacious five seat cabin, the KONA Electric is designed for busy lives. It also comes equipped with advanced tech throughout. 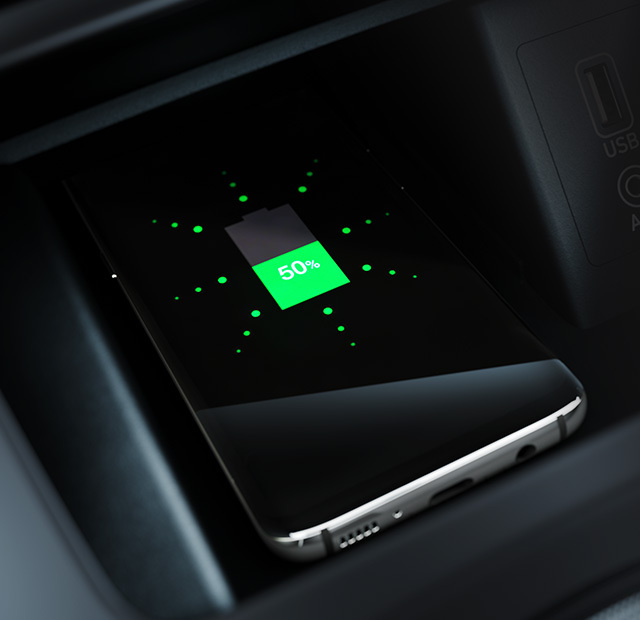 Wireless charging Located in the centre console in Premium models and above, a wireless charging pad (Qi standard) lets you easily charge a compatible Qi-enabled smartphone without the use of cables. 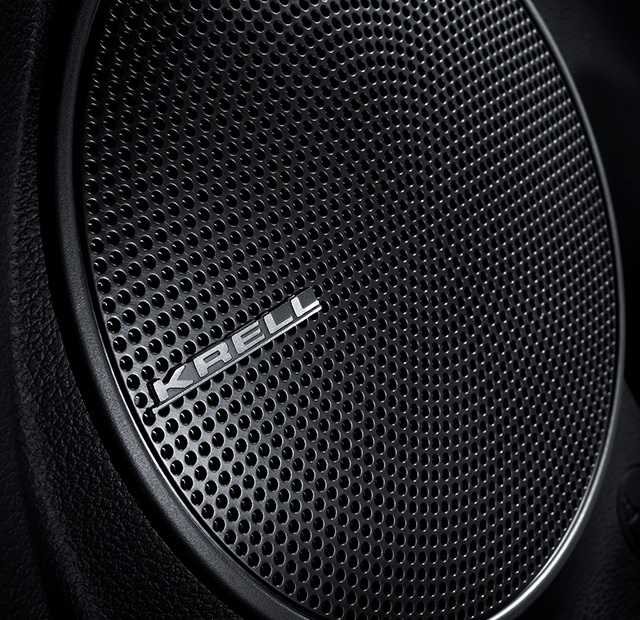 100 mm centre speaker and a 200 mm subwoofer speaker, the eight-channel amplifier delivers 45 W per channel to fill the cabin with crystal-clear audio. Climate pre-settings Wake up to a warm car. 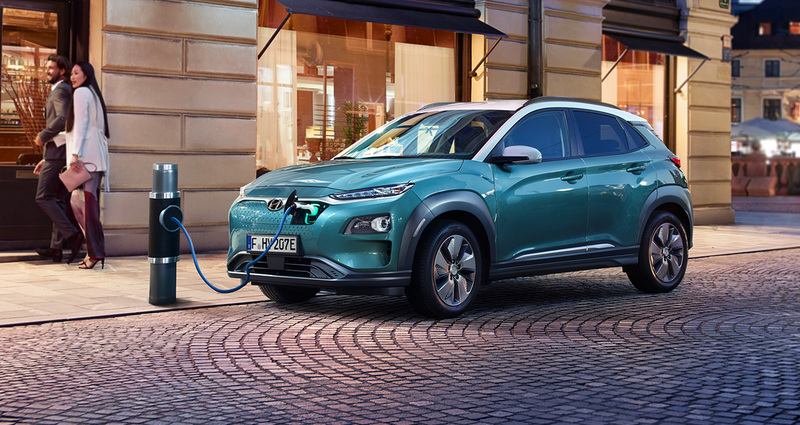 When connected to an external power source – like at home in your garage – you can schedule a time that you would like to have your KONA Electric pre-heated to a temperature of your choosing. 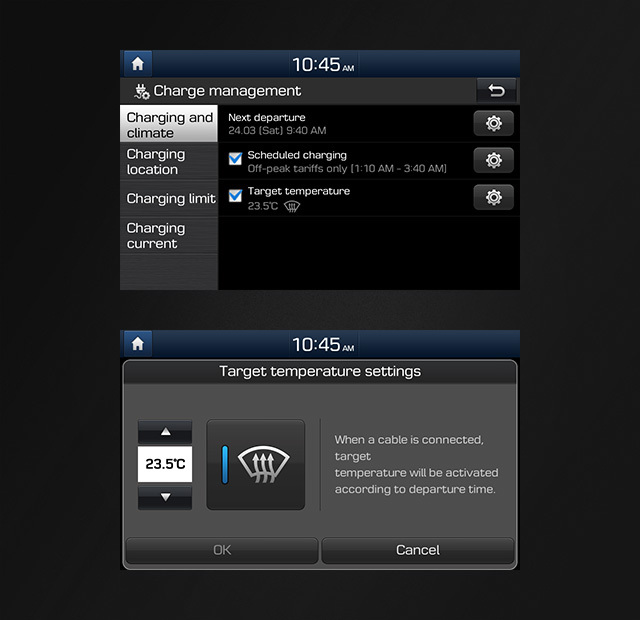 This not only makes for a warm welcome on chilly mornings, but also saves battery power that would be needed to heat the car while on the road. 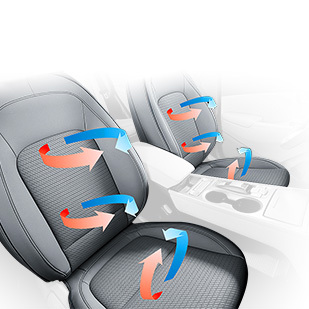 Heated / ventilated seats Nice and cool? Or warm and cosy? 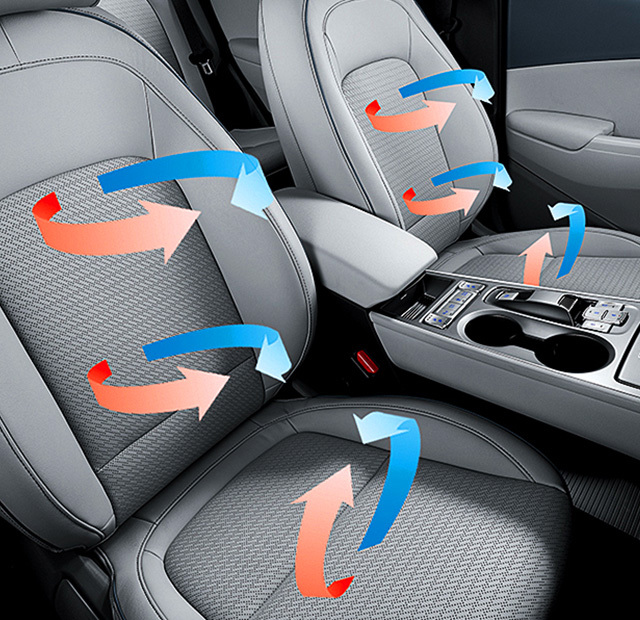 The front seats on Premium SE models are available with a 3-step ventilation and heating system for a comfortable drive in every kind of weather. 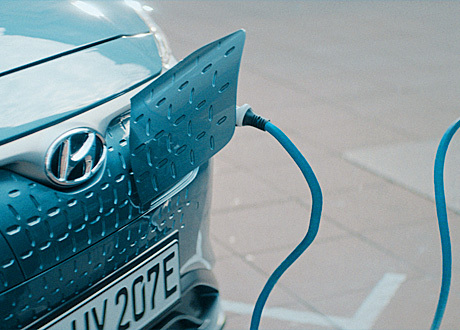 Enjoy electric driving at its best. 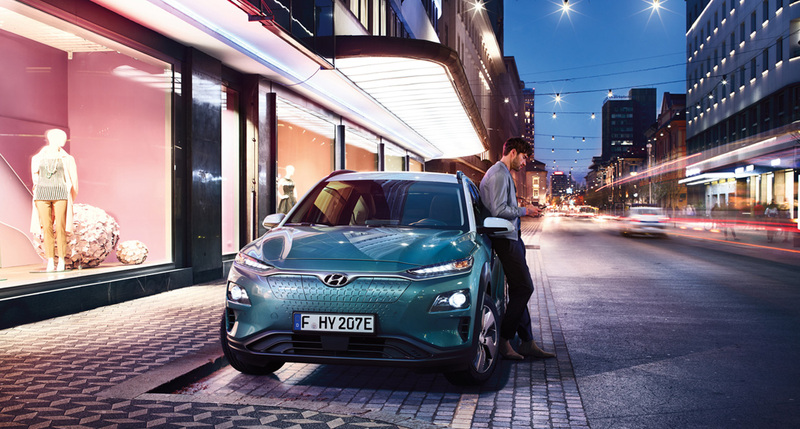 Lightning quick off the line thanks to the 395 Nm of instant torque delivered through the all-electric powertrain, this sporty SUV accelerates from 0 to 62 mph in only 7.6 seconds in the 64 kWh version. 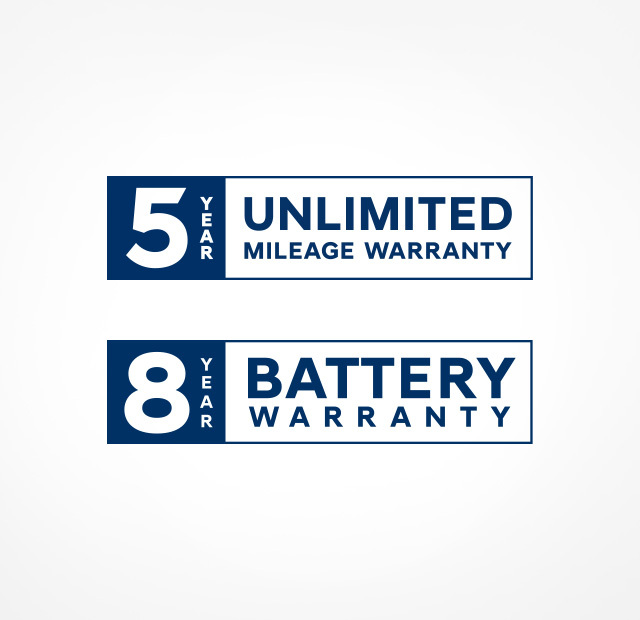 You define your preferred range by selecting from two battery versions: the 39 kWh version with up to 180 miles on the WLTP cycle and 279 miles in 64 kWh version. with a top speed of 96 mph. with a top speed of 104 mph. 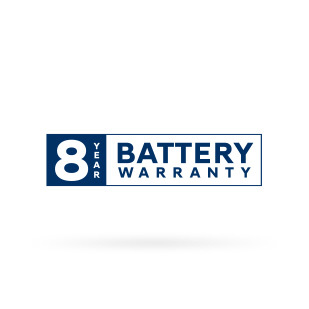 charge and discharge efficiency, along with outstanding maximum output. also enables higher battery efficiency and a longer battery life. characteristics and a practical everyday driving range. 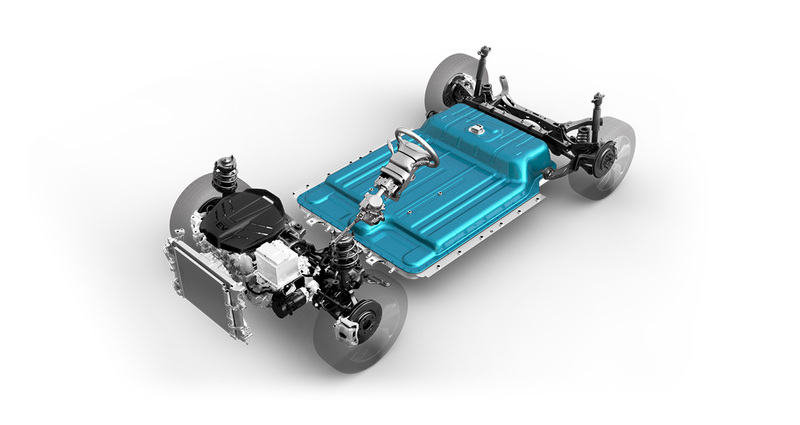 KONA Electric’s completely new platform was designed with an electric powertrain in mind. 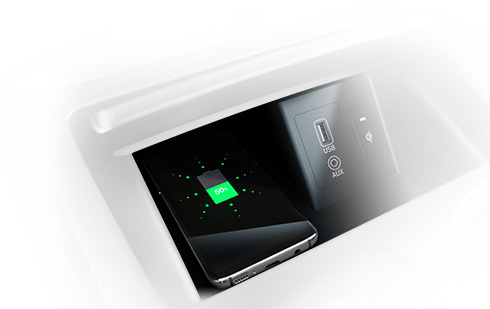 This enables the space-saving integration of the battery packs without compromising passenger or cargo room. the battery by using the electric motor to slow the car. and the battery is not being charged. and charging strength is the lowest. and charging strength is stronger than level 1.
and charging strength is stronger than level 2.
the conventional brake pedal. Charging strength is the strongest in this mode. It is also possible to actively brake the car using the paddle shifter. Simply pull the left paddle shifter and hold. You can slow the car to a complete stop in this way without pressing the conventional brake pedal. announcing its presence to pedestrians, cyclists and the blind. 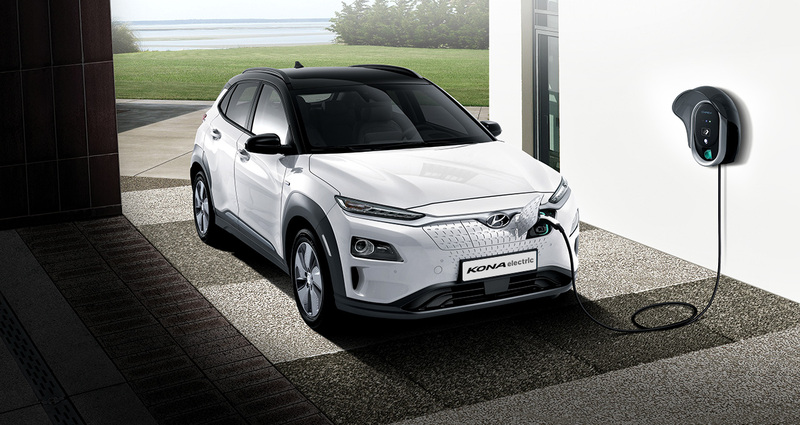 KONA Electric has plug types to suit your grid connection at home, or the types of fast-charging stations you have access to. minutes to charge to 80% state of charge (SOC) for the 64KWh version and 57 minutes for the 39KWh version. 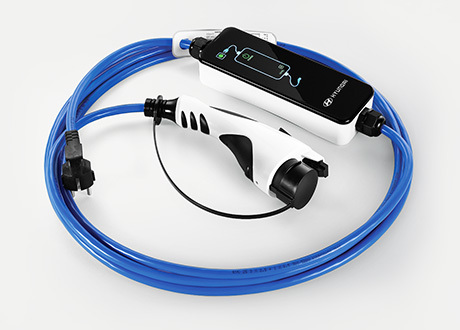 with a 7.2 kW on-board charger, which converts AC power from the wall socket to DC power that charges the battery in the vehicle. 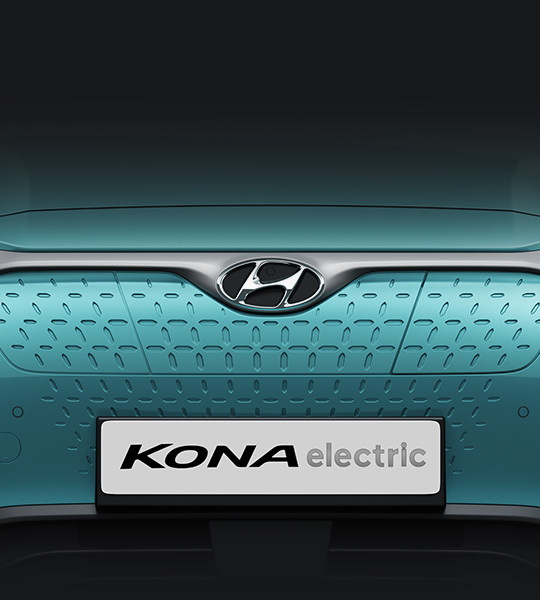 Programmable charging KONA Electric’s advanced battery management system gives you complete control. 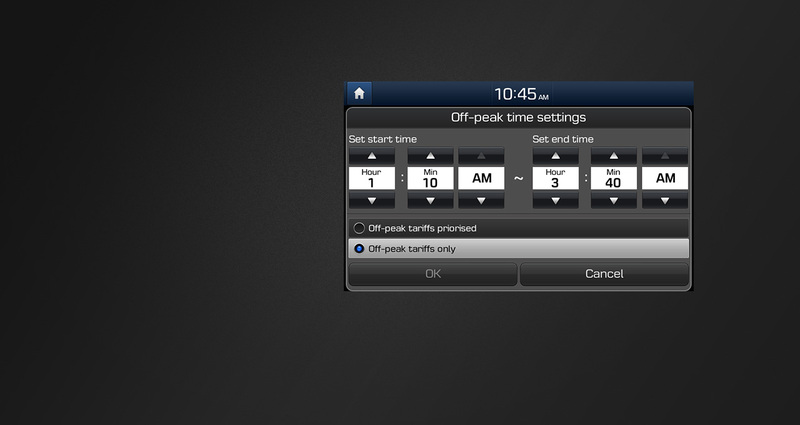 Personalise your charging times to best fit your schedule and budget. Battery status One look is all it takes. 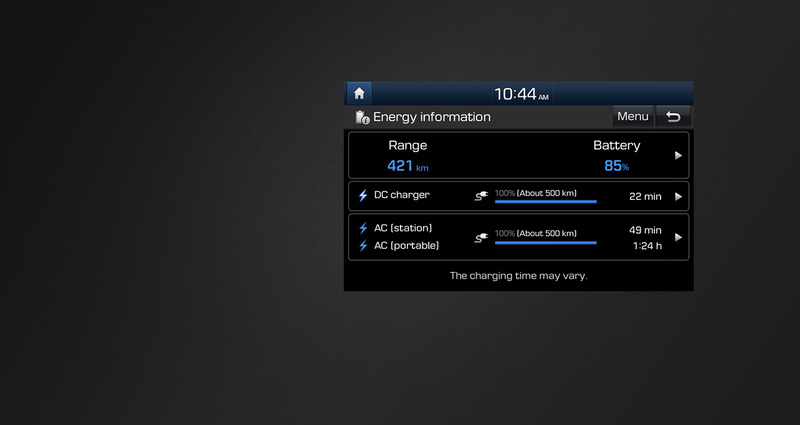 Range and battery state of charge are clearly displayed, as well as charging times when plugged into the various types of chargers. 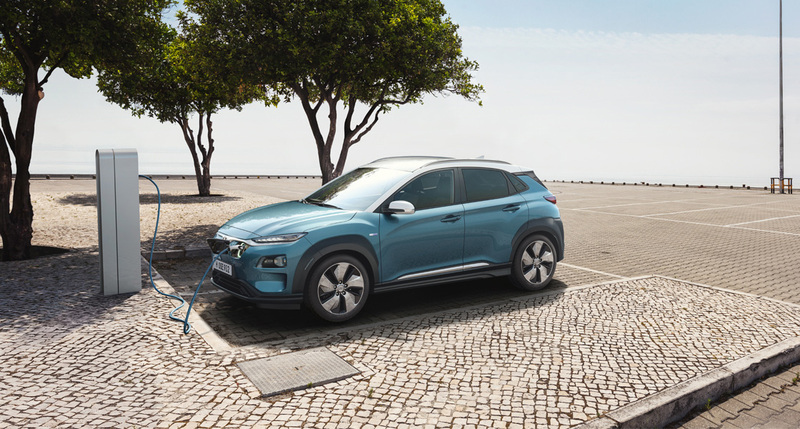 Charging time reservation Make the most of off-peak electricity rates with the charging time reservation function, which allows you to schedule the times at which you’d like your KONA Electric to stop and start charging. 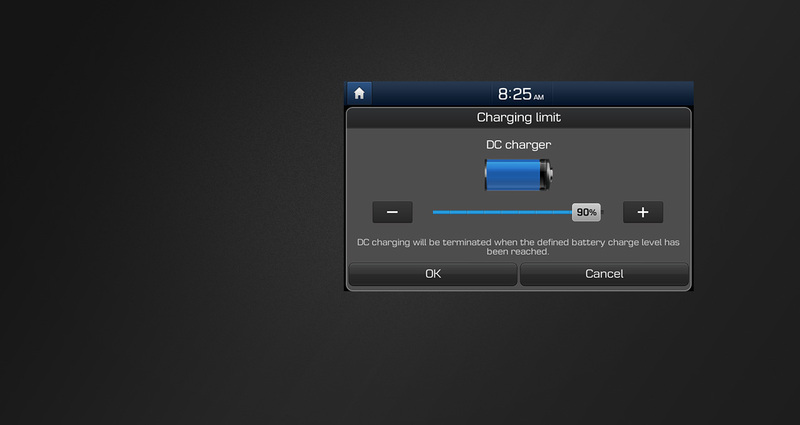 Charging limit Set a charging limit to take advantage of a faster charging stations when you’re out and about, and then fully charge the battery at home to take advantage of low night-time electricity rates at night. 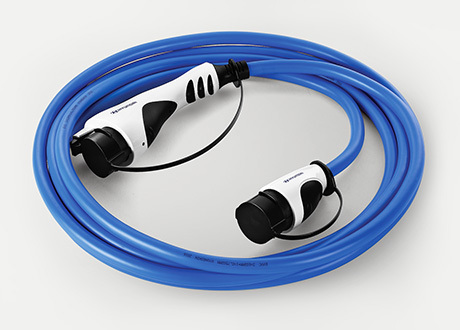 KONA Electric is equipped with an in-cable control box charging cable that you can plug right into a normal wall socket. This charging cable is intended for emergency use only. 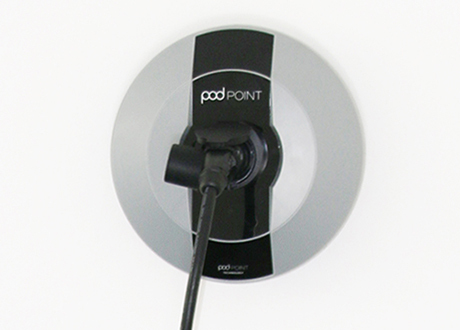 Many drivers of electric vehicles choose to have a wall mounted charging point installed at home for faster charging vs. a normal ‘trickle charge’ wall socket. These units are fused independently from the household circuit. at direct current (DC) rapid charger stations. 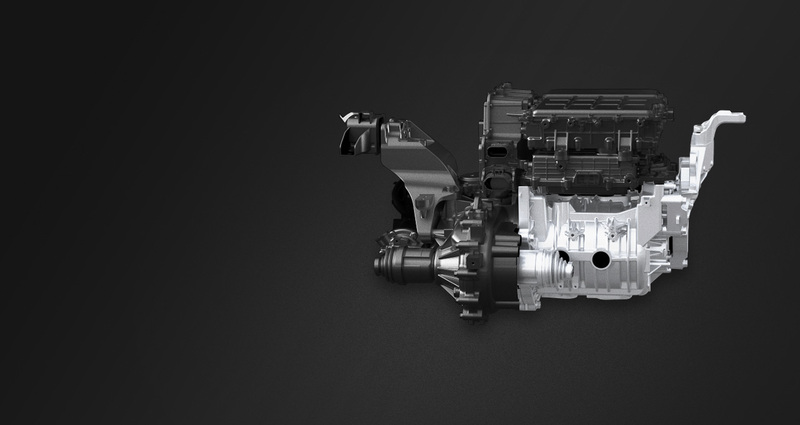 bringing together the latest in active safety technology for more peace of mind on the road. 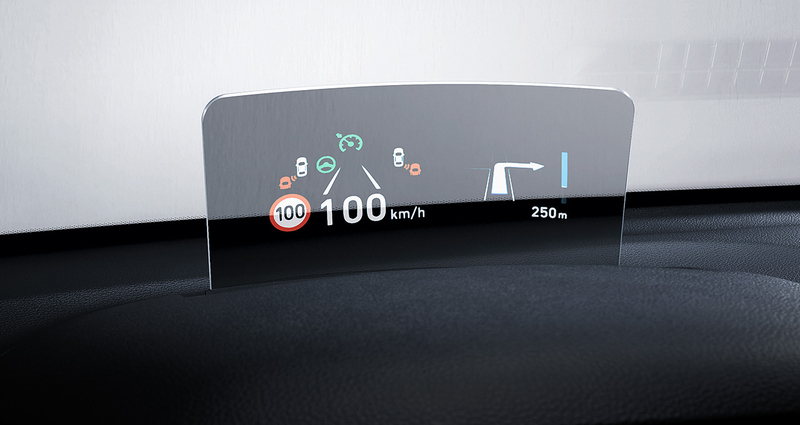 This smart system maintains a set distance from the car in front, automatically reducing or increasing speed to a pre-set limit according to traffic conditions. When the car comes to a standstill in traffic, the SSC monitor will look out for movement; when movement is detected, you’ll be prompted to tap the accelerator to reactive the cruise control. 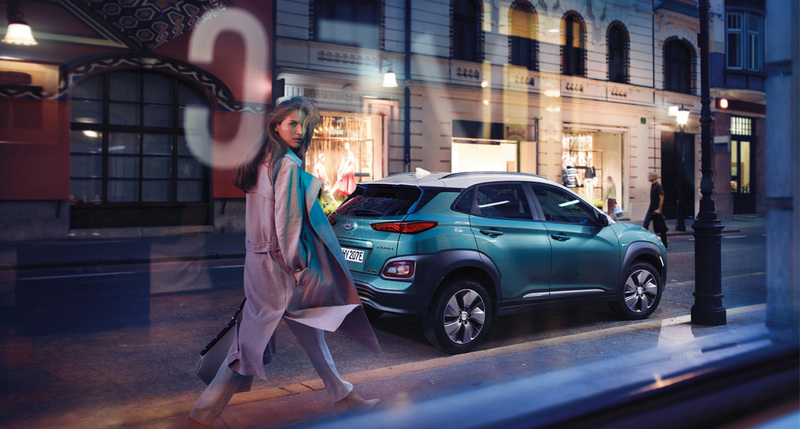 The All-New Kona Electric is fitted with AEB with pedestrian detection, an advanced active safety feature that alerts drivers to emergency situations, braking automatically if required. 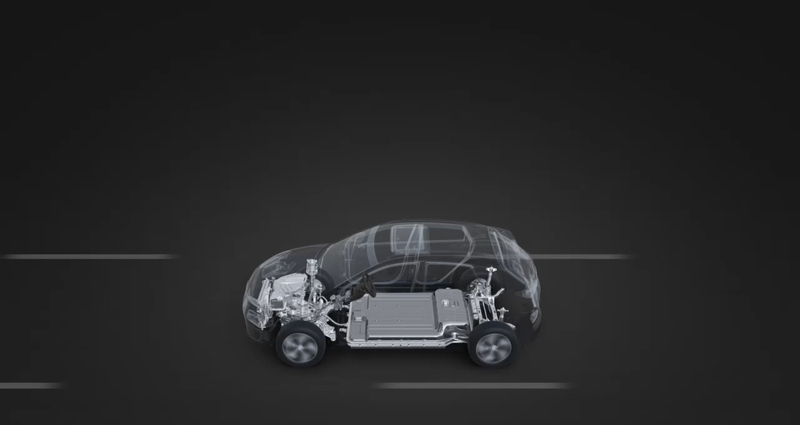 Using front radar and camera sensors, AEB operates in three stages. 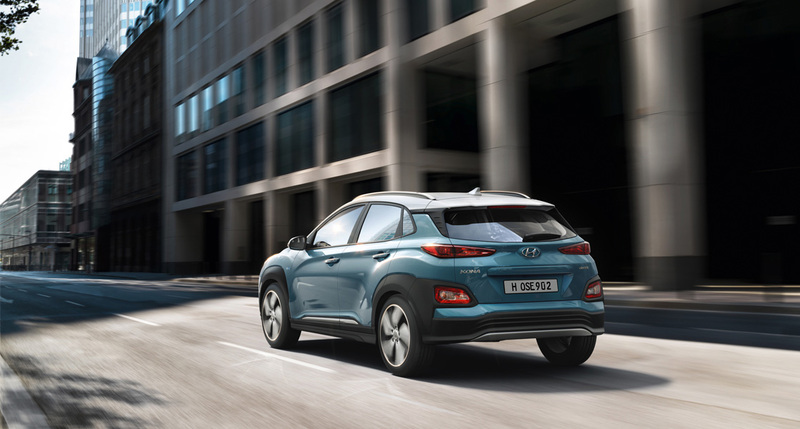 Initially warning the driver visually and acoustically, it controls the brake according to the collision danger level, and applies maximum braking force to avoid a collision or minimise damage when a collision is unavoidable. The system is activated when a vehicle or pedestrian is sensed in front of the car, operating at speeds of 5 mph or above. Using the rear corner radar, RCTA reduces the risk of collision with approaching traffic when reversing out of narrow areas with low visibility. Using radar to scan a 180-degree area behind the vehicle for approaching cross traffic, RCCW alerts the driver visually and audibly. The KONA Electric Premim and Premium SE feature LFA. 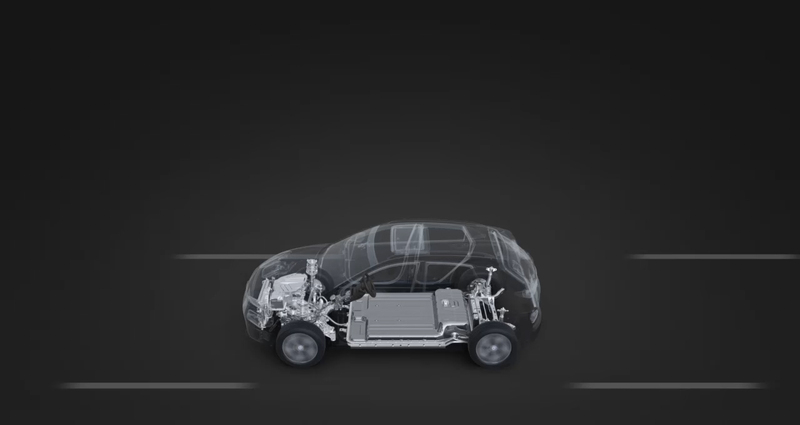 When activated, it keeps the SUV centred in its lane at speeds between 0 and 70 mph (functional up to 93 mph where permitted) on highways and city streets. Standard on KONA Electric, LKA uses the front camera to monitor the lines of the road. In case of an unintended lane departure, it will warn the driver and can apply counter steering torque to guide the car back to the lane. Also using radar, BSD monitors the rear corners and, if another vehicle is detected, a visual alert appears on the exterior mirrors. If the driver then activates the indicators, an audible signal is emitted. Galactic Grey metallic paint is included as standard, at no additional cost. 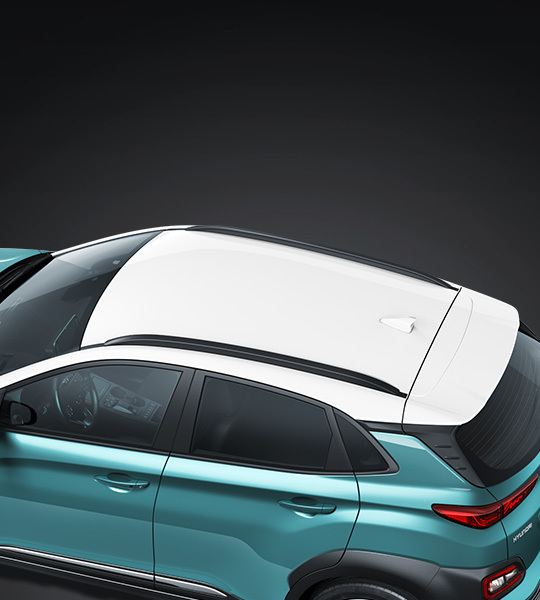 Two Tone Roof option available on Premium and Premium SE only.